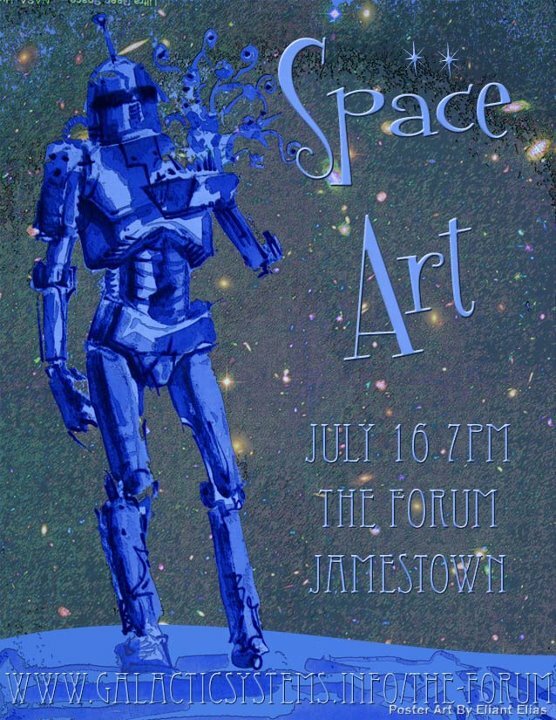 JAMESTOWN – Galactic Systems Headquarters (northwest corner of 2nd and Main Streets, Jamestown) will host the opening of a space themed art exhibit on Monday, July 16 at 7 p.m. The event will take place in GSH’s The Forum and will feature a collection of Space related art that, according to Galactic Systems’ Conor McGibonny, will feature everything from robots to spaceships and science to stars. McGibonny, who was recently featured on WRFA’s Arts on Fire program, adds that the exhibit will feature both local, national and international artists. Featured Artists: Alan Bernal, Alex Glazier, Braedan VanOrd, Britnee Ruppert, Bronson Abbott, Carlos Plata Cuéllar, Devon Urquhart, Eliant Elias, Elsa Bravo Valencia, Felipe Barroso Alcalá, Gary Robert Peters Jr., James Bliss, Kaylea Stoeltzing, Kerry K Frederes, Manuel De La Peña, Mario Neftali, Casillas Fonseca, Mason Lange, Melissa Ballesteros Parada, Pascual Gomez, Ruben Olvera, Χριστόφορος Μπαλάσκας, and more. Admission: Pay whatever you want.